We both determined dinner was vegetables, whether grilled or made into soup it had to be vegetables. Possibly 7, or 8, menus later we returned to our hotel as I’d seen vegetables on their (expensive) menu. 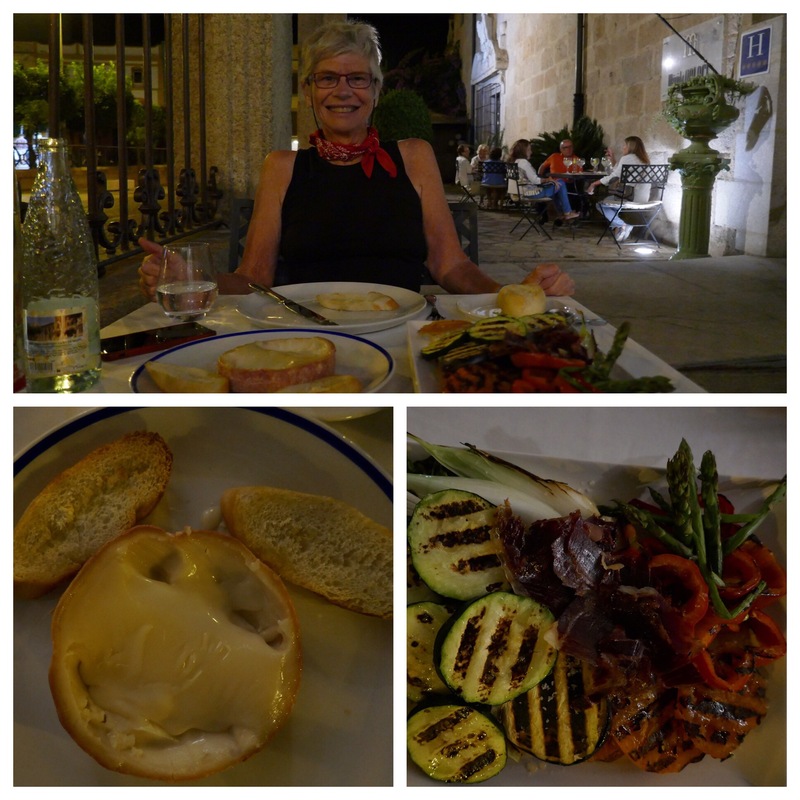 Not only did they have grilled vegetables but they also had a regional specialty, sheeps cheese. Not just any sheeps cheese but a round with the top removed and the contents warmed leaving a thick melted cheese within. (Torta de la Serena). Served with thin slices of toasted bread. Oh wow. Oh wow. We shared the cheese and a large plate of veggies. Expensive in the end but a peak experience, both the cheese and veggies. I’ve never fully adapted to Spanish food. Too few vegetables for me and salads almost inevitably based on iceberg lettuce, my least favourite. I’m sure I miss some good things through ignorance at times though. And, had V’s sister not suggested she try Torta de la Serena neither of us would have known about it. It’s my second or third trip to both. Both are well presented and fascinating. Imagine standing on the site where gladiators fought each other or poor, tormented, wild animals. 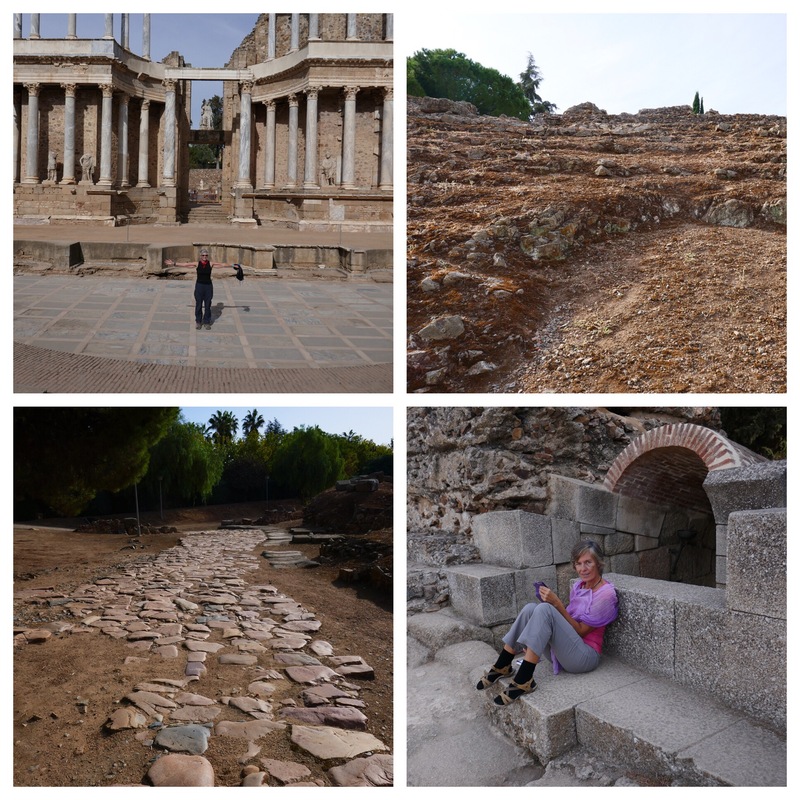 You can also sit in the adjacent (amazing) theatre where the romans and their descendants watched whatever. Wow. Today’s theatre was different: a choice between a high scissor lift with a photographer (boring and noisy) or, a couple getting photos done after their very recent wedding. Her dress had a very extensive train and she wore the most amazing bright red shoes underneath it. So, different from my last time here when I watched a school play in the theatre. I should have started with this: an unusually successful FaceTime chat with JP, thanks to the very good wifi in this hotel, and then a breakfast to kill your liver. 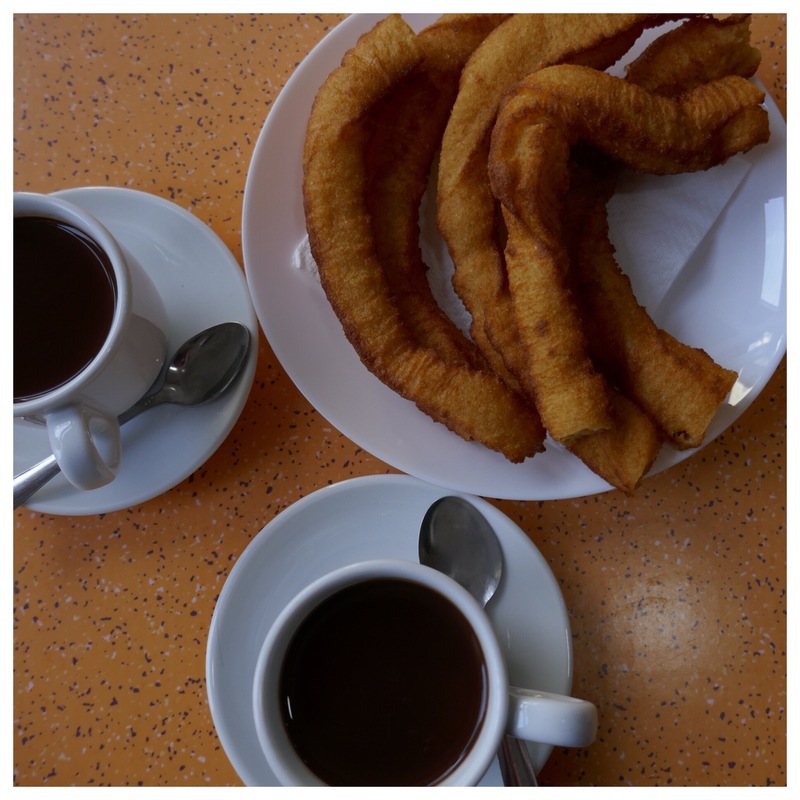 The breakfast was in a churrería so, chocolate and churros. The chocolate was, of course, the wonderful thick Spanish type. So, many calories from the deep fried churros and the sugary thick chocolate that I won’t eat for hours more. (I’m ignoring the very nice green olives I ate with the coke light.) Anyhow we bought fruit and some nuts for later at a local market and both headed back for a nanna-nap. Such is the life of a peregrina. Tough.